Writings on being an Enterprise Architect / I.T. Architect in academia. The growing interdependence of our systems is driving the complexity of our systems towards the edge of chaotic systems. The choices that we make are no longer focused on finding the perfect solution. Instead, we can see many possible solutions, many of which are good solutions. 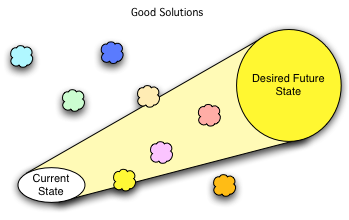 The choice is then to pick the solution which builds positive interdependency and limits negative interdependency. Fig. 1: Growing interdependency has put us at the edge of complex and chaotic systems. If you take two years to design a great solution, the landscape will have changed so much that the solution may not be applicable. The level of complexity makes finding and defining the perfect solution even more difficult. 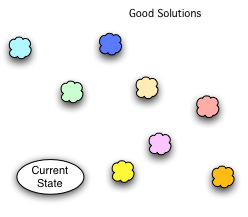 The level of interdependence means that even more good solutions are available – when many systems are connected, many systems could be used to provide the solution. I agree with what Ron has come to believe. The level of integration between systems is very high. The expectation for real-time interactions has become the norm. Users expect to see real-time flight information. They expect real-time updates on openings in courses. Students can see, in real-time, the bus schedule, where they are located and the location of nearest bus stop and the location of the buses on their routes. This interdependence has driven complexity to the point where perfect solutions are hard if not impossibly to design and deploy. Therefore, we must choose from many good solutions that exist. We need to act quickly to implement some solution to meet the rapid rate of change. 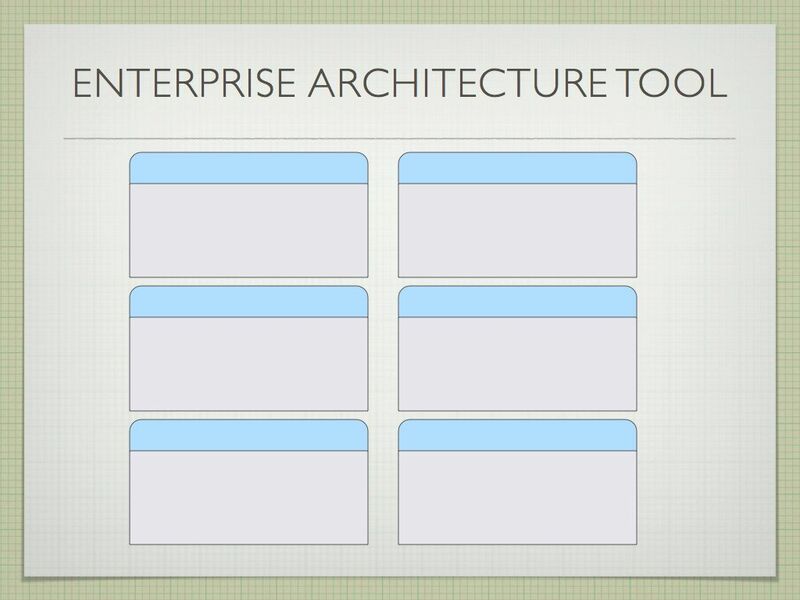 This is where Enterprise Architecture and the other architecture practices can help. If we look out to the future and think about the desired state, then we can begin to sift out those good solutions which move us towards that future state. For us, we had stated that Service Oriented Architecture was a strategic direction. That bounded the future state some. In the student area, we had a future state process diagram. This diagram outlined improvements to the way that students manage course data and move through finding courses to enrollment. This put another boundary on the future state. When it came to think about how we get course roster type information out to a new learning management system (Moodle), we were able to use that projected future state to pick from the possible solutions (flat file transfer, shared database connections, web services) those which moved us closer to future state. Fig. 4: EA can help filter the good choices that move you towards the desired future state. The rate of change and interdependency drives the importance of an architectural approach. If you have not thought about the future state, then there is a multitude of choices. To pick from many choices, you have to establish some factors that affect your selection. In a restaurant, this might be dietary restrictions, cost, the weather outside. In technology, it is often quickest and cheapest. But those factors, in this complex environment are often shortsighted and misguided. The quickest and cheapest solution might need to be replicated many times for many systems. This would increase the interdependency in a negative way and push you even closer to a chaotic system. A more expensive, slower solution might serve you well over the long haul. Architecture can help you make those choices in a framework that is focused on the future and on the overall complexity that you are creating. Enterprise Architecture (and the other architecture practices) can help sort those good solutions and help make sure the choice you make is along the path to desired future state. 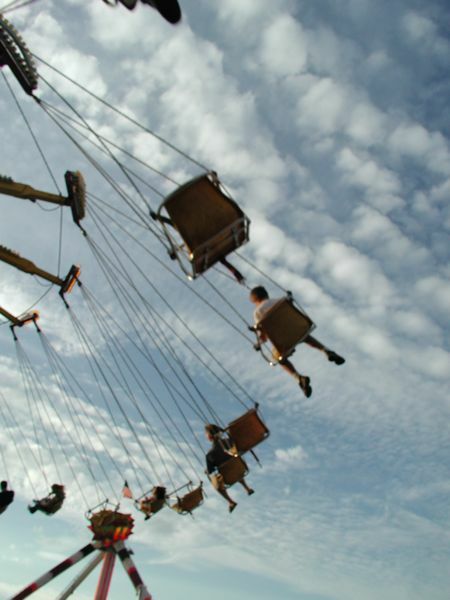 This entry was posted in Academia, Enterprise Architecture, Headline, JimPhelps, Work and tagged Complexity, Enterprise Architecture on March 11, 2010 by jimphelps. I’ve been pondering, wondering and worrying about how to bring value out of ITANA.org to the world at large. I struck upon a metaphor over dinner with a friend at EDUCAUSE recently that brought my vision and the issues I’m pondering into sharp light for me at least. I watched Captains Courageous, a wonderful 1937 film with Spencer Tracy, recently. This is a story about a spoiled boy who ends up on a fishing Schooner. 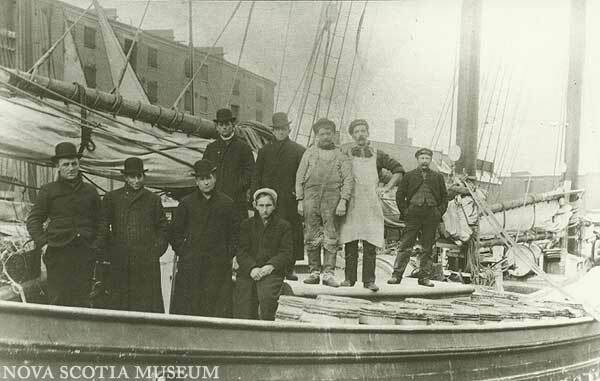 The schooner would launch dories with fishermen aboard them. The dories would bring there catch back to the schooner where the fish would be processed and packed. The schooner would then bring the catch back to the mainland and to the public. ITANA.org spins up sub-groups that work on a topic. These are the dories if you will. ITANA.org and its sponsors, EDUCAUSE and Internet2, act like the schooners and the delivery systems on the mainland. How do I make sure those sub-groups have the resources needed to bring back a meaningful deliverable? How do I make sure that the delivery from the sub-group to ITANA.org is a smooth as possible and as efficient as possible? How do I make sure that the sub-groups are working in fertile fishing grounds? How do I make sure that what we are delivering is what the mainland wants? These are the things that I’m wrestling with as I get ITANA.org up and running. I see a lot of interest and potential in the bright minds that participate in ITANA.org. We have great conversations. We generate interesting thoughts an comments. Those thoughts and comments get lost in the minutes from the phone calls or the hallway chats or the blog posts and notes from meetings. How do I turn those things into more meaningful deliverables? Each sub-team should have one person dedicated to gathering up content. They should pull responses out of the minutes and into a wiki page or section. They should glean the good stuff from the email chatter and add it to the wiki. They would be responsible for rolling-up all the various bits and pieces that go by into a single reference point. Each sub-team should have a set of deliverables as part of its charter. For example, the Data Management sub-team agreed to deliver a survey and the survey results. Each sub-team should produce some artifact(s) that can be shared with the world at large (e.g. a paper, or video or blog post) that others can consume on their own time. I/we should have a standard way of “publishing” these deliverables and a standard set of ways of getting the news out that they have been published. We should also be creative in our thoughts about how we engage beyond the core of ITANA.org. Where does Twitter, Facebook, LinkedIn, the EDUCAUSE blogs and wikis, podcasts, screencasts, vodcasts, etc. fit into the mix? That’s what I’ve been pondering. Anyone have input? I’d love to hear it. 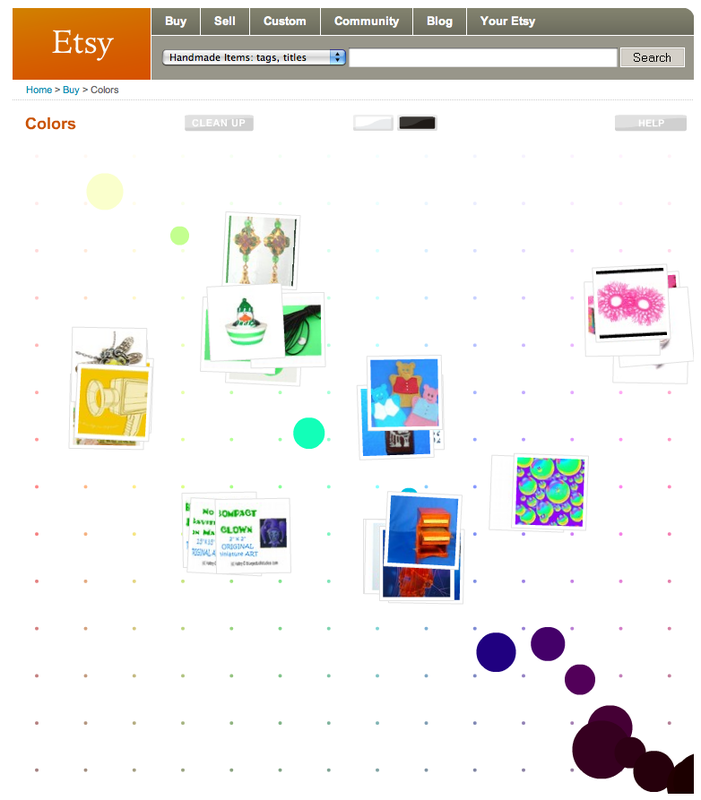 This entry was posted in Featured, ITANA, JimPhelps, Work and tagged ITANA, planning on November 12, 2008 by jimphelps. Brick diagrams are a strategic planning tool that I mentioned in passing in my ITANA talk at EDUCAUSE. Since then, I’ve had several people ask for more information. So here it is… more information. 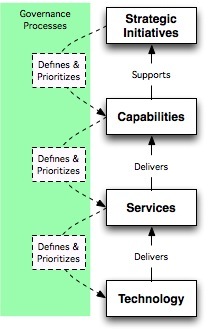 Brick Diagrams are used by NIH in their Enterprise Architecture planning process. You can see the NIH brick diagrams and their taxonomy for the brick diagrams on the NIH EA Site. Other institutions use similar planning tools. Read on to see links to other places that use something similar and to download slides for a talk about Brick Diagrams that I gave to our Management Team. This entry was posted in Enterprise Architecture, Featured, Presentations, Work and tagged Brick Diagram, Enterprise Architecture, Strategic Planning on November 7, 2008 by jimphelps.